What is SOIL’s ecological footprint? We know that turning wastes into compost adds much-needed topsoil to Haiti’s eroding hillsides, and that it keeps the nutrients (not to mention the pathogens) from poop out of fresh water, but does it have ecological benefits in terms of reducing climate change? Dr. Rebecca Ryals, who is a postdoctoral research associate at Brown University, came to Haiti to help us answer those questions. Rebecca sought to partner with SOIL because she is drawn to the intersection between science, public health, and social change, just like us! Through an ongoing partnership, she will measure greenhouse gas emissions from SOIL’s activities, compared to more traditional waste treatment sites here in Haiti. 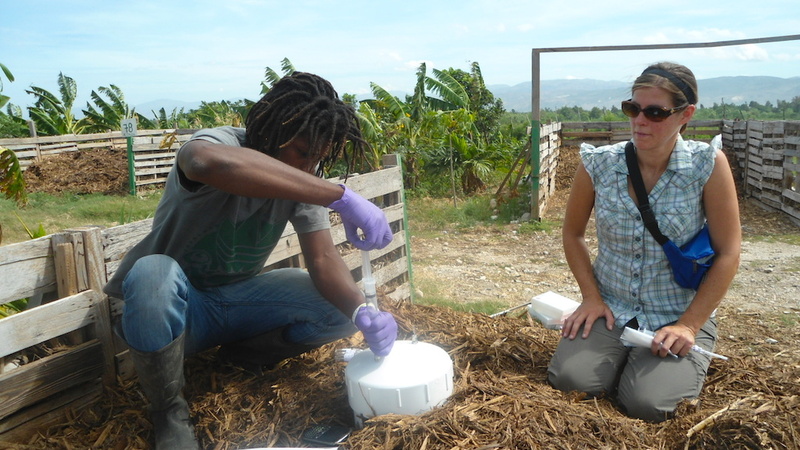 Along with SOIL staff in Port-au-Prince and North Haiti, Rebecca collected samples of greenhouse gases emitted by SOIL’s compost piles, as well as open-air sludge ponds. Rebecca will analyze the samples in her lab back at Brown University to measure carbon dioxide, a well-known player in climate change, as well as methane and nitrous oxide, which aren’t as widely recognized despite being 20 times and 300 times more powerful at trapping heat than CO2. 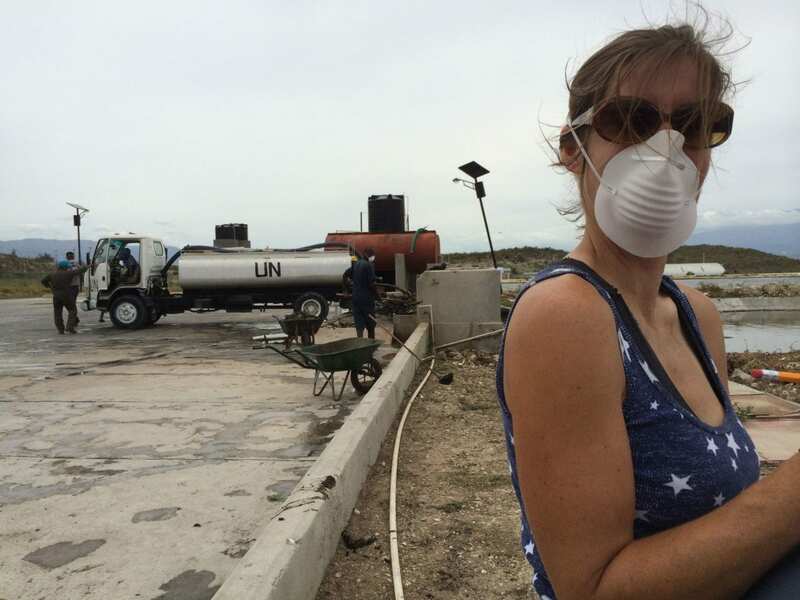 Rebecca gets a hand setting up gas sampling at an open-air sludge pond where private septic companies empty waste. Not only was it more pleasant for the sampling team to march around on compost piles than it was to wade knee-deep in the sludge ponds, they also expect the results from compost piles to show reduced gas emissions relative to the sludge ponds. This is because the process of composting is aerobic and the primary gas produced is carbon dioxide, whereas the waste stabilization ponds are anaerobic and produce high volumes of methane, a much more powerful greenhouse gas. If harvested the methane can serve as a valuable energy source (as is the case with biodigestors), but in the case of open air stabilization ponds the methane is released directly to the atmosphere, with significant climate implications. By tracking the emissions over time on SOIL’s compost piles as compared to open-air sludge ponds, we’ll have even more data to convince the world that compost is an ecological superstar in so many ways. We will have the results later this summer, so stay tuned to find out how well compost scores. 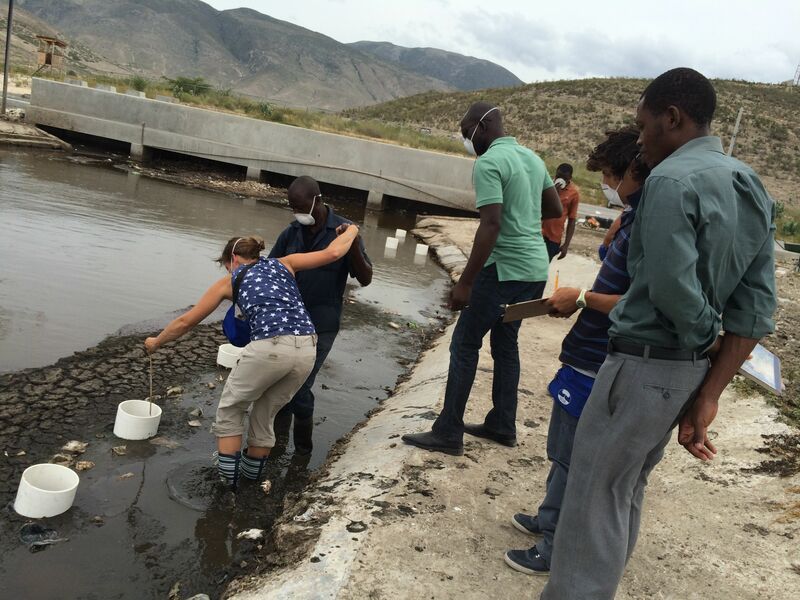 We also want to extend a huge thank you to DINEPA, the sanitation authority for the Haitian government, for their support of this research. Rebecca training SOIL’s own Jimmy Louis in gas sampling at the Port-au-Prince compost site. 1 Reply to "EcoSan Combats Climate Change"
Congrats on doing this important work. I have a theory that Greenhouse Gases and smell can be reduced by using finished compost as cover material in our Urine-diverting Dry Toilets. If you have a chance to look at this, it would be very appreciated. Please consider posting your results on forum.susana.org of the Sustainable Sanitation Alliance.